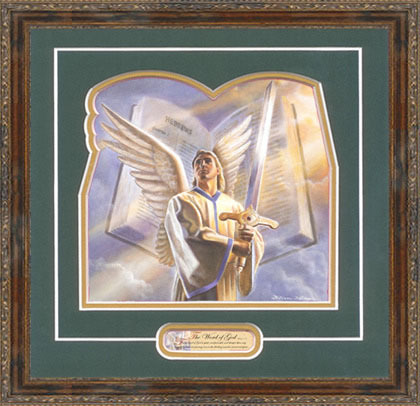 William Hallmark art prints of The Word of God for sale painted by artist William Hallmark. 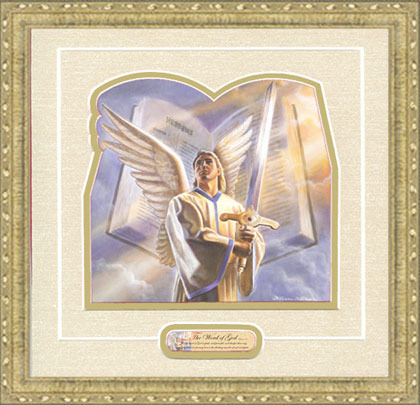 Purchase this print with a green or gold crackle double mat (no frame) for an additional $20.00. 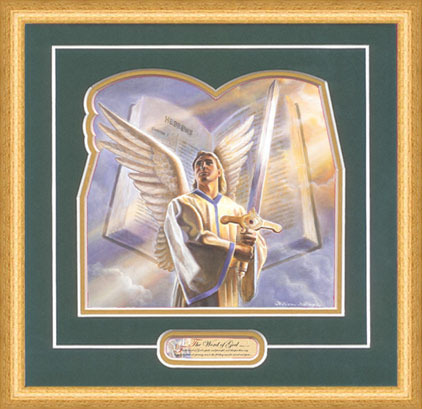 Add artist William Hallmark's signature for an additional $15.00. 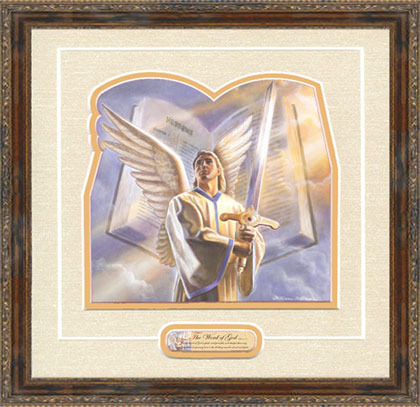 View framing options for this print. Please add $9.50 for shipping, handling, and insurance. Purchase this print with a green or gold crackle double mat (no frame) for an additional $60.00. Upgrade to an Artist Proof (A/P) for an additional $25.00. There are only 200 Artist Proofs. The Scripture caption is Hebrews 4:12. Purchase this print unframed (no matting or frame) for only $30.00. Upgrade to conservation UV anti-glare glass for $20.00. Request a custom print caption (maximum 25 words) for an additional $20.00. Please add $12.50 for shipping, handling, and insurance. 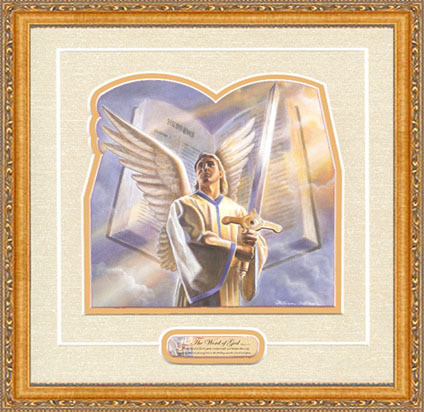 Purchase this print unframed (no matting or frame) for only $95.00. Upgrade to conservation UV anti-glare glass for $50.00. 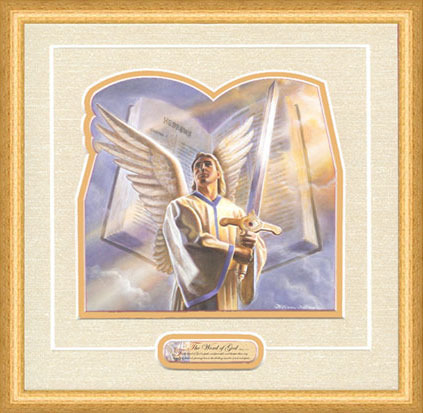 The Word of God is a wonderful depiction of God's powerful, majestic, and ever present angels sent to watch over all His children. 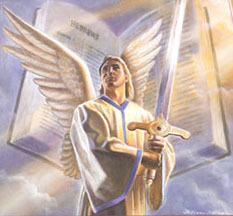 William has painted the Bible here as the "Sword" (the Word of God), wielded by a powerful angel. The Scripture caption reads: "For the word of God is quick, and powerful, and sharper than any two edged sword, piercing even to the dividing asunder of soul and spirit" (Hebrews 4:12). The Word of God copyright© by William Hallmark is prohibited from being copied. All applicable copyright© laws apply and are reserved by William Hallmark. William Hallmark art, Christian art, gifts, artwork, art work, prints, photos, paintings, pictures, and prints of The Word of God by artist William Hallmark for sale. The Word of God by artist William Hallmark can be purchased at special sale prices at Christ-Centered Art.